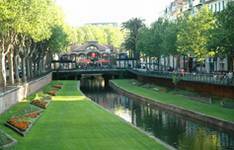 Perpignan is located in the deep South of France - in the lower Languedoc region. It is a modern city (with plenty of history) and is blessed with a fabulous climate. It has a growing population of over 160,000 people. Perpignan remains as interesting now as it was over a thousand years ago when it was founded as an outpost of Catalan civilisation. Since then, the counts of Roussillon and the kings of Majorca have both made good use of it. Make sure you visit Perpignan castle for a glimpse of a Kingdom that existed in Majorca - now long resigned to history. Thankfully, these days the city is a much more relaxing and peaceful place to unwind and spend time. It is a pretty city, which is eager to show off to foreign guests. Next to every building of interest in the city is a sign with information in French, English and Catalan. The city centre is partly pedestrianized with two rivers flowing through it, the Basse and the Tet. The old town is elegant and well preserved. The area is packed with things to do. Whether it's a splendid summer's day or a rainy Monday you'll easily find something to occupy you. To learn more about Perpignan's interesting and often turbulent history there are a number of museums to visit. If you'd like something more physical to do then area is perfect for skiing and hiking. If your feeling especially adventurous then head to the Pyrenees for some rock climbing. Perpignan is a highly fashionable place in which to live and so property prices tend to be higher than average. Is the climate in the winter months warm? Do you know Perpignan better than we do? Do you have photos of Perpignan? Access: The town has its own airport with regular flights to and from the UK with Ryanair and bmibaby. Economy: This affluent town is boosted considerably by tourism. Interesting fact: The town was once a part of the Kingdom of Majorca.